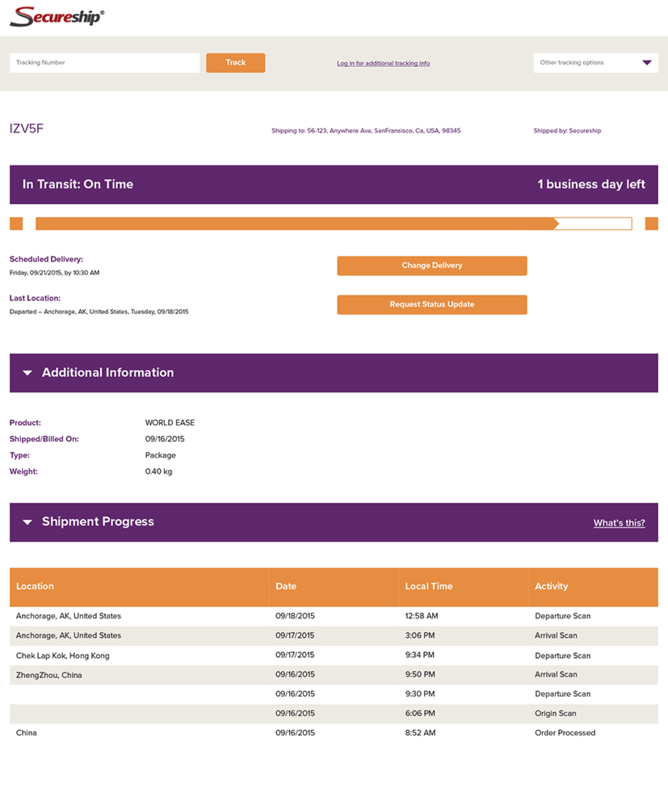 Tracking is a great way to stay updated on your package’s progress, but how exactly does it work? In fact, there are a lot of details and fine print involved in tracking that most people aren’t aware of. Here in shipping 108, we’ll cover everything you need to know about tracking and help you understand how to use it to help you and your business. When you ship a package with tracking, you’ll receive a code which can be used to monitor its movement from origin to destination. Codes can vary between characters, but they all accomplish the same goal. Whenever your box reaches a new place, it’s scanned by the carrier, and its current location is automatically put online along with the time at which it got there. Depending on the carrier and individual package, you may also be able to view other pieces of information, such as the scheduled delivery shown below. If you have a number and you want to track your package, you’re in the right place! 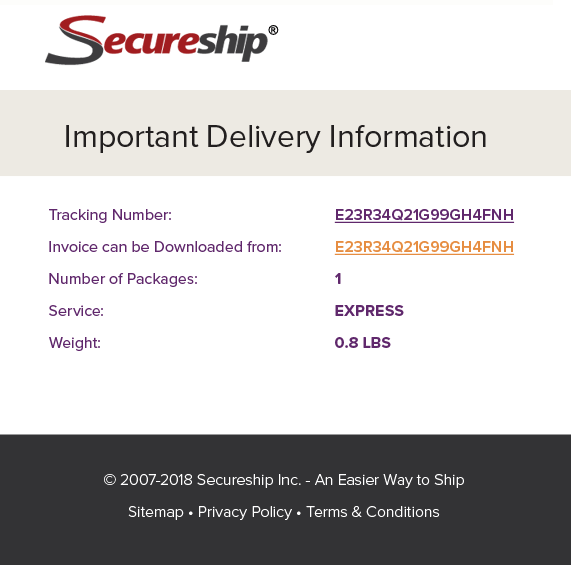 Secureship offers tracking through all the major carriers, so simply so simply navigate to your shipment history page and click on the shipment you want to track. Tracking is a great way to see when something’s wrong with your shipment and get ahead of any issues that might come up. If you’re looking for more ways to avoid shipping problems, read Shipping 104 for help reducing lost packages, and Shipping 106 for delays. While packages are typically scanned several times throughout the shipping process, there are actually two distinct types of scans. The first kind, physical scans, are probably what you expected all scans were: an employee physically scans your box with a scanner. Physical scans are extremely reliable—you can’t scan a package unless it’s there. On the other hand, logical scans are based on where the carrier expects the package to be. For example, if they have a truck that is unloading a container or bag of envelopes, they’ll often scan the container or bag. Because of that scan, logically, it makes sense that the envelopes within that container are currently being unloaded so all items within that container will now show an unload scan. These are intended to keep you aware of your shipment’s movements even when there’s nobody available to scan the item, but they are obviously less trustworthy than physical scans. Unfortunately, there isn’t a reliable method of distinguishing between the two. There are some situations and tracking scans that are intended to inform you of any unforeseen issues with your shipment. UPS often calls these “exceptions” depending on the specific scenario. These can include missorts, weather delays, incorrect addresses, or anything else that led to a delay or return of your package. In some of these circumstances, the sender is expected to correct the error—for example, a mistake in the address. Because of the time-sensitive nature of these problems, we recommend checking your package’s progress regularly. If something does go wrong, you’ll hopefully find out quickly enough to fix it. Where Can I Track My Shipments? The best place to find out where your shipments are is right here on Secureship! We offer multicarrier tracking, allowing you to check on all your items at once. Log into your account and get started. Congratulations—you’ve finished the 100 level of our Shipping Learning Center! By now, you should have a solid understanding of the basics of shipping, but there’s a lot that we still haven’t covered. To learn more, start with Shipping 201, the first lesson in the intermediate level, which covers shipping insurance.